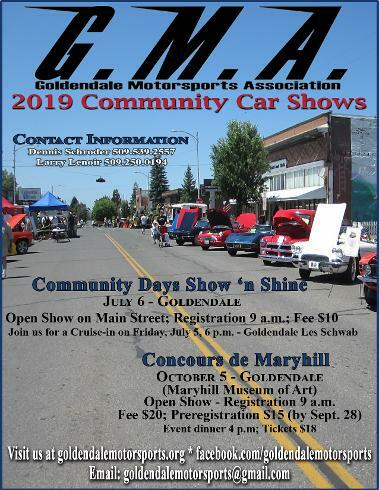 Concours de Maryhill Car Show | Goldendale Motorsports Assoc. Open Car show. All makes, models and years are welcome. 9 a.m. to 4 p.m.
Silent auction. Items include local wines, motor oil, winery tour, and more. Raffle prizes. Grand prize is a flat screen SmartTV. Drive up the historic Maryhill Loops Road from noon to 2 p.m. (open to the public). Bob's Texas T-Bone. Ticket price: $18. Tickets can be purchased the day of the show. Click below to view and print the event dinner menu. This is an Open Car Show, so all makes, models, and years are welcome. Show runs from 9 a.m. to 4 p.m.
$20 entry fee per car. Preregister by Sept. 28th for only $15 per car. One dash plaque per entry. Receive 2 free Maryhill Museum passes per vehicle entry.